UFC 134 Silva vs Okami Rio Brazil | MMA Fighting Events Videos Techniques UFC Fight Picks and News. 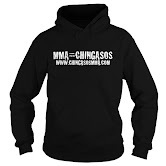 This Saturday August 27, the UFC returns to Brazil for UFC 134. The UFC isn't holding back on this card as it's nicely stacked with intriguing fights. As a bonus and a gift to Brazilian MMA fans, the card is also stacked with Brazilian fighters. 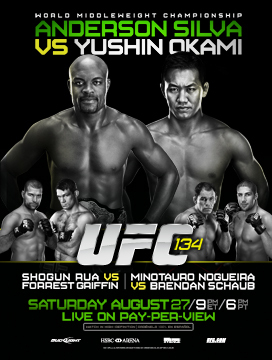 UFC 134 is featuring a title fight between Anderson Silva and Yushin Okami. This fight is a rematch and Silva is attempting to avenge a loss to Okami. While the UFC is trying to sell it as Silva trying to avenge a big loss, Silva really lost via a disqualification due to an illegal kick. Silva was actually dominating the fight until the illegal kick that stopped the fight. Nonetheless, it should be a test for Silva as Okami did take him down in their first meeting and has only improved since. Besides the title fight, another good fight on the UFC 134 card is Mauricio Rua vs Forrest Griffin. This one is truly a rematch as Rua will be trying to avenge the loss to Griffin. Griffin has shown a suspect chin and if Rua can get back to fighting the way he did in Pride, look for Griffin to go to sleep early in this one. Minotauro Nogueira vs Brendan Schaub should be interesting as it's another Brazilian and Pride veteran going up against a young hungry fighter in Schaub that is still trying to make a name for himself in the UFC. Nogueira might just have too much experience and I see him taking this one in a tough fight. Lytle vs Hardy, Fight of the Year? Will Tito Ortiz Fight Again? What Happened to Fedor Emelianenko?